From Christianity's very beginning, it has had a difficult relationship with the world of money. Through developing sophisticated understandings of the nature and wealth-creating capacity of capital, Christian theologians, philosophers, and financiers exerted considerable influence upon the emergence and development of the international financial systems that helped unleash a revolution in the way the world thinks about and uses capital. 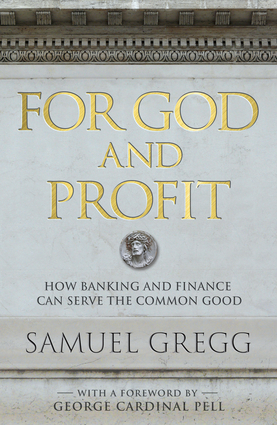 In For God and Profit, Samuel Gregg underscores the different ways in which Christians have helped to develop the financial and banking systems that have helped millions escape poverty for hundreds of years. But he also provides a critical lens through which to assess the workings—and failures—of modern finance and banking. Far from being doomed to producing economic instability and periodic financial crises, Gregg illustrates that how Christian faith and reason can shape financial practices and banking institutions in ways that restore integrity to our troubled financial systems. Samuel Gregg is research director at the Acton Institute. He writes and speaks regularly on morality and economics. He is the author of many books including, among others, On Ordered Liberty (2003), The Modern Papacy (2009), Wilhelm Röpke's Political Economy (2010), Becoming Europe (2013), and his prize-winning The Commercial Society (2006). He is published in journals such as the Harvard Journal of Law and Public Policy; Journal of Markets & Morality; Economic Affairs; Notre Dame Journal of Law, Ethics and Public Policy; Library of Law and Liberty; First Things; Ave Maria Law Review; Oxford Analytica; Communio; Journal of Scottish Philosophy; University Bookman; Foreign Affairs; and Policy. His opinion-pieces have appeared in the Wall Street Journal Europe; American Banker; Investors Business Daily; National Review; Public Discourse; American Spectator; The Federalist; Australian Financial Review; and Business Review Weekly. He holds an MA in political philosophy from the University of Melbourne, and a Doctor of Philosophy degree in moral philosophy and political economy from the University of Oxford.